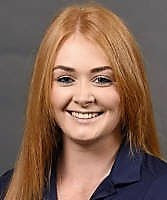 Rachel Walker, from Dumfries, in her last few weeks at the end of four years as a student at Old Dominion University, Norfolk in the state of Virginia, was a member of the team of five who this week won the 2017 Conference USA Championship at the Verandah Club, Fort Myers in Florida. 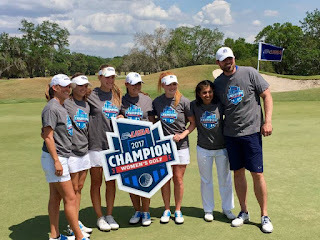 It was the first conference title success during the 15 years that Old Dominion has had a women's golf program. Rachel Walker and the Old Dominion team now go forward to the NCAA finals, another first for the college. Rachel, who was beaten finalist by Clara Young in the 2015 Scottish women's amateur championship at Monifieth, had rounds of 78, 76 and 84 for a total of 238 over a par 72 course of 6,194yd. Walker finished T46 in a field of 55 competitors. Other Brits taking part in the C-USA championship were Georgina Blackman, pictured right, from Essex, a third-year student at Western Kentucky, and team-mate Abbie Smee, a freshman from Hull. Blackman finished T7 with scores of 72, 74 and 74 for four-over 220. Freshman Smee shot 81, 74 and 81 for a total of 236 and a T42 finish. Jenna Burris (Middle Tennessee) was the individual winner by six shots with very good scores of 67, 70 and 72 for seven-under 209.